Apologies if the rest of the video game-savvy world already jumped on this one decades ago, but I just learned there’s a new bit of relevance for Captain N: The Game Master. And I’m always happy to bring up Captain N.
A two-sentence primer, in case your childhood Saturday mornings played out differently than mine did: Captain N was a cartoon series that sought to blend the universes of various NES-era video games by uniting them though a “real world” protagonist: Kevin Keene, a San Fernando Valley teen who gets beamed into a video game universe where he gets to interact with characters from the Mega Man, Kid Icarus and Castlevania franchises. Kevin, however, was an original creation, as was the sole female character: Princess Lana, the regent of Videoland. It’s Princess Lana that I’m interested in. 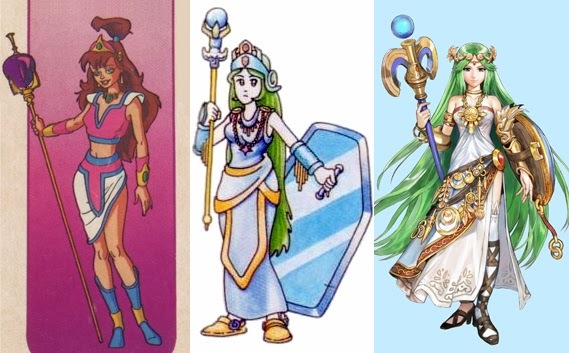 Even though I’ve loved the Kid Icarus series since I was wee, I only recently realized how much Lana looks like the Kid Icarus damsel in distress, a green-haired goddess called Palutena, her name apparently a corruption of Parthenos, one of the appellations for Athena. I mention all this just because it’s weird to think of the princess from a video game-themed Saturday morning cartoon show in the context of the virgin war goddess for whom the Parthenon was built. Depsite the premise, Captain N actually pulled from a narrow selection video game universe. Princess Zelda was appearing on the Zelda cartoon, and Princess Toadstool on the Super Mario Bros. Super Show, and neither Castlevania nor Mega Man had leading ladies at the time. That leaves Kid Icarus, the only game with an all-powerful, female monarch on the throne. I mean, look at them. Doesn’t Princess Lana look like a ’90s-tastic riff on this Greek goddess character? The gaming website Flying Omelette even goes as far to point out that “[Lana] looks more like Palutena than Mega Man looked like Mega Man or Simon Belmont looked like Simon Belmont.” Surely, they’re also close enough that one could be the inspiration for the other, right? When we were working on Captain N, the Nintendo corporation gave us a bunch of 8-bit images of their characters. But, in some other cases they sent us some drawings or packaging art. I can't remember for sure if that was the case with Palutena, but from the look of her design that certainly was where her design came from. The similarity is too close to be a coincidence. Kudos to you! A funny story. When we were designing Mother Brain, the Nintendo corporation didn't give us any art for it. Instead, they gave us a video game. Unfortunately, none of us were good enough to get to the Mother Brain level -- and the DIC animation studio didn't want to pay us artists to sit around playing a video game. So, one of the secretaries brought in her son and he got us to the Mother Brain level. We grabbed some screen shots and were able to complete the design. Ha. In the end, Mother Brain ended up a creature like none other on Saturday morning TV, even being voiced by Levi Stubbs, the lead singer for The Four Tops and also the voice of Audrey II in Little Shop of Horrors. Mother Brain, by the way, was also announced as appearing in the new Smash Bros. game, and I feel unusually catered to — like someone is using my memories of back then to help determine what’s coming back now. Unless I'm mistaken, there's a Castlevania episode of Capt. N that features an old man wizard character who is supposed to be Sypha Belnadez/Fernandez from Castlevania 3. The show incorrectly made her male because the American instruction manual incorrectly said Sypha was male. Not exactly "incorrectly"; it was a red herring much like Samus (who was also described as male in the Metroid manual), so as to keep her identity as a woman a secret. It's actually canon that she's done that, too, if I'm not mistaken. If anything, perhaps the ruse was too good? After all, if they couldn't reach the end of Metroid-- not beat, just reach the end-- then what chance did they have of actually finishing Castlevania III? The wizard in that episode was never actually mentioned by name, so it's debatable that it was meant to be Syfa. Season 3 was full of so many characters that didn't actually come from any video games that I'm inclined to agree with those who think they just made him up without any real knowledge of the Syfa character. He DOES mention having been an ally of Trevor's, however. The episode also features the Poltergeist King, who's mentioned in the manual but not in the game itself. Ha! I've long suspected this myself, ever since seeing it mentioned on a Kid Icarus fansite. Funny that Lana was never actually attributed to that game, though. As for Super Smash Bros., all we need now are Simon and maybe Assist Trophies of King Hippo and Eggplant Wizard. It is indeed very strange that this is entirely possible, so many years after the fact. Who came first, Palutena or Sailor Pluto?? Because THEY look like twinsies to me. Palutena predates Sailor Moon by a few years, though I wonder if green-tressed, staff-wielding maiden is an archetype over in Japan. I mean, I especially love that they couldn't even be bothered to send over a screen shot or some concept art of Mother Brain. Instead, they just sent a copy of Metroid--probably along with a Post It note saying, "You can see what Mother Brain looks like by beating this game." Not that a Mother Brain who DID look like the one in the game would have made a whole lot of sense either. By the way, I remember the head writer mentioning that Samus wasn't in the series because he'd never heard of her. Oddly, there were occasional appearances by a creature who I think is supposed to be a cartoony version of Kraid. Not sure the designers made it to him either, but I think his picture is in the instruction manual. Yeah, you have to wonder what video game press kits looked like back then. You have to wonder if Nintendo more tightly controlled the Super Mario Super Show or the Legend of Zelda series. You know, we never see Lana's mother, so maybe she's Palutena's daughter. Except that Palutena is based on a virginal goddess. We got a Lana, and it's not in Kid Icarus; it's in Hyrule Warriors.